Three things have contributed greatly to people’s misunderstanding and ignorance concerning God’s gift of holy spirit. First, the translators capitalize the “H” and “S” and translate pneuma hagion as “Holy Spirit” when there is no reason in the Greek text to do so, and even when the context indicates the gift of God, holy spirit, is the subject being discussed. Second, the translators, not being aware pneuma hagion can refer to the gift of God, added the definite article “the,” making the Bible read “the Holy Spirit” when there is no word “the” in the Greek text. When the article “the” is absent in the text, it is usually an indication the text is referring to the gift of holy spirit, and not “the Holy Spirit.” Third the translators translated pronouns associated with pneuma hagion as masculine, “he” instead of “it,” a subject we cover in Chapter 4. The reason the translators have been so insensitive to the subject of the gift of holy spirit is that most have believed the doctrine of the Trinity , which says “the Holy Spirit” is the “Third Person” in the Trinity, and for the most part fails to recognize that pneuma hagion can refer to the gift of God. It is due to the doctrine of the Trinity that translators capitalize the “H” and “S” when the context is clearly referring to the gift God gives, add a “the” when none is in the Greek text, and translate the pronouns associated with pneuma hagion as masculine, even when the context is clearly referring to the gift of God and neuter pronouns are called for. However, there have been Trinitarian scholars who have recognized God’s gift of holy spirit. Bullinger is quite correct. In many places where pneuma hagion refers to the gift of God, translating it as “the Holy Spirit” instead of simply “holy spirit” misleads the English reader. We need to recognize pneuma hagion can refer to the gift of God, and when it appears in the Bible ask ourselves if it refers to God or His gift. When pneuma hagion appears in the Greek text without the article “the” (about 50 times in the Christian Scriptures) it usually refers to the gift of God.2 However, when pneuma hagion has the definite article “the,” it can be referring to either the Giver or the gift. When the definite article “the” is used with the gift, as in Acts 2:38, Scripture is simply making the point that holy spirit is “the” gift, i.e., the one being referred to in the context or in the scope of Scripture. Thus, in the case of Acts 2:38, because Peter was referring to the gift people would receive and what the Apostles had just received, the gift of holy spirit was “the” gift that had been poured out that day. Acts 2:38 is a verse from Peter’s sermon on the Day of Pentecost, the day that holy spirit was first poured out in New Birth, and thus the day the Christian Church started.5 Thousands upon thousands of Jews had gathered at the Temple in Jerusalem to celebrate the Hebrew Scriptures feast of Pentecost, and Peter made an impassioned appeal to them, saying that if they repented and made Christ their Lord, they would receive the gift of holy spirit. Peter’s sermon was effective, and about 3,000 people were saved that day (Acts 2:41). What should not be lost on us, however, is the distinct difference Peter made between God, the Giver, and holy spirit, the gift. Peter made the point that God had promised He would “…pour out my Spirit [spirit] on all people…” (Acts 2:17). It is God who made the promise, and who, through His Son Jesus, pours out on people not Himself, but His nature, holy spirit. God is the Giver; holy spirit is His gift to mankind. The context, specifically Acts 2:4, makes it clear that pneuma hagion in verse 38 refers to the gift of God. It would be much easier to see that Acts 2:4a refers to the gift of God had the translators followed the Greek text and not added the definite article “the” to the English Bible. The Apostles were not filled with God, they were filled with the gift of God, holy spirit. Another verse referring to holy spirit as a free gift, dorea, occurs in Acts 10. Putting together the above three verses, we learn that believers are filled with the gift of God, holy spirit, which is the nature of God. In his teaching on Pentecost, Peter made it clear that God raised Jesus from the dead and then gave him the gift of holy spirit that had been promised in the Hebrew Scriptures, after which Jesus did the actual pouring out of the spirit on the people (Acts 2:32 and 33). This verse, like Acts 2:38, makes it clear that holy spirit is something given by God, our heavenly Father. Although almost all English versions are like the NIV above and read, “the Holy Spirit,” the Greek does not have the definite article “the.” The verse should read, “…how much more will your Father in heaven give holy spirit to those who ask him!” How simple, and how beautiful. Sadly, many people today are in the same position as the disciples in Ephesus when Paul first came to their city. They do not know God’s gift of holy spirit is even available. How could that have been the case? Well, Acts 19 informs us that the one who had discipled these people in Ephesus taught only John’s water baptism, so they did not know about the gift of holy spirit they received when they were saved. Therefore, he who rejects this instruction does not reject man but God, who gives you his Holy Spirit [“holy spirit”]. For example, Acts 1:5 records Jesus telling the Apostles they will “… be baptized in holy spirit…” (Author’s translation). The Apostles were about to be baptized, fully immersed, in God’s gift of holy spirit. Although almost all translations read “the Holy Spirit,” there is no article “the” in the Greek text, and there is no reason in the context to capitalize pneuma hagion. The Apostles were not baptized in God, but in His gift. Then Peter said, “Ananias, how is it that Satan has so filled your heart that you have lied to the Holy Spirit…. We have now seen that the Greek words pneuma hagion can refer to either God, the Giver, who is the “Holy Spirit,” or to the gift of God’s nature, which is also holy and spirit, but should be referred to as “holy spirit.” We are now in a much better position to understand the great thing God did for us in giving us His very nature and thereby filling us with His power. For further study we recommend our class: “One Day With The Creator,” Segment 18. 1. Bullinger, op. cit., Word Studies on the Holy Spirit, p. 15. 2. Bullinger makes the following observation: “Pneuma hagion (without Articles) is never used of the Giver (the Holy Spirit), but only and always of His gift” (E. W. Bullinger, The Companion Bible, (Zondervan Bible Publishers, Grand Rapids, MI, reprinted 1974), Appendix 101, p. 147). We feel Bullinger’s statement is too strong, because we have seen some places where pneuma hagion does not have the article and yet refers to the Giver, such as Matthew 1:18 and 20. However, Bullinger is generally correct, and if there is no article the gift of holy spirit is usually being referred to. 3. W. E. Vine, The Expanded Vine’s Expository Dictionary of New Testament Words, (Bethany House Publishers, Minneapolis MN, 1984), “gift,” pp. 476 and 477. 4. The words pneuma hagion are clearly referring to God’s gift, which is holy spirit. Because most translators are not aware of this, their versions read, the “Holy Spirit.” When we encounter a verse that reads “Holy Spirit” when it should read “holy spirit,” we will add [holy spirit] to indicate that God’s gift of holy spirit is being referred to. When the translators add the word “the,” such that their translation reads “the Holy Spirit,” we will add [No “the.” Read “holy spirit”]. 7. The Greek word for “gifts” in this verse is doma, which is the Greek word for “gift” that places more emphasis on the concrete character of the gift than on its beneficent nature. Vine, op. cit., Expository Dictionary, “gift,” p. 477. Jesus was not referring to the gift in the Administration of the Sacred Secret (see Appendix A) but as it will be available in his future kingdom. 8. The Greek word “receive” is important, and points to the manifesting of holy spirit. This will be covered later in Chapter 6 when we explain Acts 8:14–17. 9. The New International Version and other versions have the phrase “a Holy Spirit.” Someone looking at a Greek Interlinear or a Greek text may wonder why there is no “a” in the Greek. The answer is that the Greek language has no indefinite article, which is “a.” In Greek, when there is a noun, such as “horse,” it is assumed that it is “a” horse. If it is “the” horse, then a “the” will be in the Greek text. 10. This is also a good verse to show that translating pneuma hagion as “Holy Spirit,” as most versions do, cannot be right. If the Holy Spirit is a person of the Trinity distinct from the Father, we would expect the verse to read that the “Father” sent the Holy Spirit, not that “God” gives “His” Holy Spirit, since in Trinitarian doctrine the Holy Spirit is “God,” and thus certainly does not belong to God. 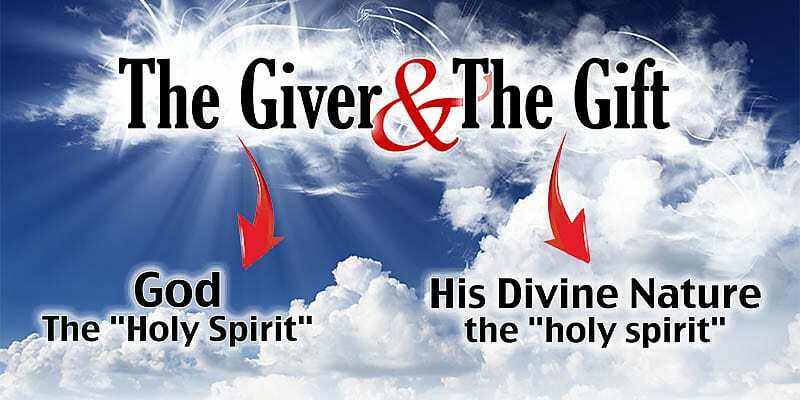 However, if the verse is referring to holy spirit, the gift of God, then it makes perfect sense that God gives it and it is called “His” holy spirit. 11. We use the RSV here because it properly refers to the spirit as an “it” in verse 16. The subject of the pronouns associated with holy spirit is covered in Chapter 4.